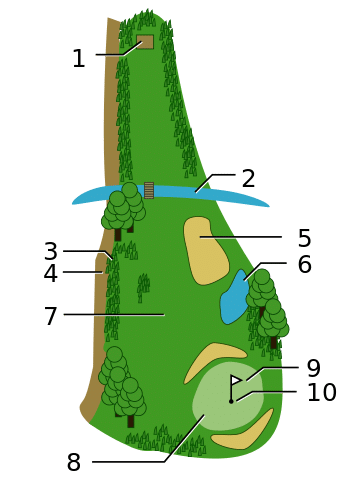 A full 18 hole game of golf can take up to 4-5 hours or more and people argue that they just can’t or don’t want to spend so much time wandering the golf course. The busy environment during the weekdays, long commutes and the need to spend more time with our families are all factors that draw people away from this wonderful game. We had a discussion who used to play and they all pointed the same flaws in golf. America’s troubled economy makes it difficult for people to enjoy the sport. Middle and lower-income golfers that have had a decrease in their pay slips have made it difficult for them to invest in membership at golf courses. Due to the recession we’ve also seen local governments close public courses due to required budget cuts. Golf designers are building, harder, tougher and longer courses in the last 3 decades in order to challenge golfers and their equipment. This combined with a rulebook made of 200 pages, make it a tough sell to new players. In the past we’ve had stars like Tiger Woods, Arnold Palmer, and Gary Player, drawing a great number of newcomers to the sport, using their charisma and skills as well as public image to push golf in the ordinary person’s home. However they have all stepped down over the past few years with no one to take their place. Arabian Gulf (Mar. 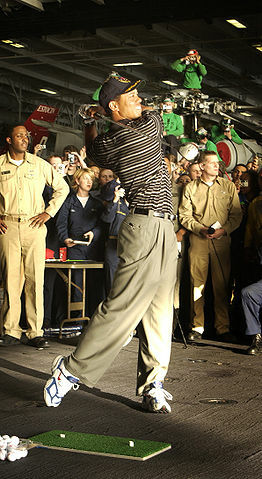 3, 2004) Sailors watch professional golfer Tiger Woods hit a few golf balls during a demonstration in the hanger bay of the nuclear powered aircraft carrier USS George Washington. Woods visited the Norfolk, Va. Based carrier in the Arabian Gulf before participating in the European PGA Tour Dubai Desert Classic. U.S. Navy photo by Photographer’s Mate 1st Class Brien Aho. Top golf, a game in which you need to hit gold balls onto huge targets in outdoor sports bars. Those are two experiments, aimed at reviving golf’s popularity, but will they succeed, I’d say that it is a long shot. Yes, golf has suffered a blow to its popularity over the past several years, yet it still holds a special place in the hearts of millions of people that still play this great game around the world. For them, it’s that long awaited rest from the world, where you can enjoy nature while doing something fun and challenging. If you are one of them, discover more on what’s trending in the world of golf. Proposed Golf Rule Changes. Good or bad idea? 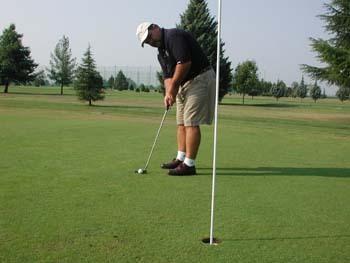 Sports Techie, golf is is far from mainstream but it is awesome in it’s own rights. The two national governing bodies of the sport, The Royal & Ancient Golf Club and the U.S. Golf Association both understand the need to make the game easier, quicker and more entertaining for all. They proposed reducing the number of rules from 34 to 24 after five years of idea exchanges. The new set of the Rules of Golf keeps the long standing traditions of golfing that began in 1744 with the integrity of the game in tact while lessening the amount of penalties. The rules changing process now undergoes six months of public feedback, then would be finalized in 2018 and finally implemented in 2019. Tiger was America’s golden child and a superstar that helped propel the sport back to former popularity as did Arnie and Jack Nicklaus. Some purists believe Jordan Spieth might be the person to inspire a new generation of golfers. I like him because of his talent but more importantly, his commitment and love to the autism community and his sister with ASD which my son has too. One thing for sure, if you ever played the Tiger Woods PGA Tour series from 1998 to 2013 published by EA Sports, you know how much fun, realistic and a huge impact the video game had on growing the sport. Woods was replaced by Rory McIlroy for his version of EA SPORTS Rory McIlroy PGA TOUR. Perhaps with the surge in eSports players across the world and the United States, the powers that be might want to pour more resources and grass roots efforts into a new video game tournament in order to help grow the sport the way kids and millennials love to engage with golf. Sorry Rory, however the new cover of PGA Tour 18 should be Spieth, just saying. I know I’d be interested as would my boy in playing for a new million dollar, winner-take-all, golf video game eSports tournament and a chance to play against Jordan.